Art Works | "The Adventures of Lisa Lemonada"
I think this would be obvious. Who knew that waiting for the elevator could be such a mind-numbing experience?? I do. It takes (literally) hours (longest so far was an hour and a half) just so we can get in the infernal lift and leave the building. I wonder if the management of Burgundy Tower is planning to do something about this. Yesterday, a spectacular battle of wills between a certain building tenant (which is not me, I assure you) and the Elevator guy occured. Said tenant claimed that E-guy was not doing his job (which extremely offended tha latter, as he must be feeling particularly high strung that day, I’m not sure). Anyway, I’m feeling exceptionally tired today (lack of sleep I guess). I finally got to fix my phone (I’m still wondering what really happened, my unit does not usually ask for a security code, which turned out to be so simple I want to bludgeon myself!) Thank goodness for the Master Code Generator. Well, instead of endlessly swooning about the release of the infernal “Twilight”, I think I’d spend my time watching out for more worthy films. At 260 minutes, its a bit long (and still too short to chronicle the life of this rather contradictory figure. Healer and Executioner. Kind and Brutal. Practical and Naive. And so on). I’ve seen several pictures of him with his wife and children (I must really get that memoir by Aleida Guevara March, his eldest daughter), and numerous testimonies from other people who were close to him, not to mention read some of his writings and I could tell he has an enormous capacity to be idealistic, egalitarian and quite affectionate; But still many percieve him as ruthless killer (he’s known in some circles as “The Butcher of La Cubana”). And it’s rather ironic that he was fully embraced by the culture he so violently despised. But the people at Cannes film festival were (most of them anyway) raving about Benicio del Toro’s performance (he got a best actor award too). I don’t think they’ll screen it here though. I’ll have to wait for the “pirated editions” then. To continue, the drawing was pretty up to my usual standards. It’s in preparation for a detailed portrait of the real Che. I’m enjoying the whole sketching process until I ran out of 2B “points” for my mechanical pencil. I really must get Jon Lee Anderson’s Che: A Revolutionary Life. A rather balanced biography they say, one which neither glorifies nor criticizes it’s main subject; but rather paints both the “good” and “bad” aspects of this complicated and sometimes contradictory man. Finally, our training exams are over. I must say this is the worst training experience so far, it’s so dull, I fell asleep several times; and everyone except for a select few seems to have an attitude problem. And did I mention the elevator? What else is there?? I must get some sleep now. Really. I don’t get enough sleep anymore. I have disturbing dreams, and when I awake, instead of feeling refreshed, it seems as though someone has decided to beat me up while I slept. Watching: “Supernatural” and “Ergo Proxy” alternately. Made another GW “photo-manip” while browsing through CrunchyRoll, looking for another movie to watch and review. Actually, I just finished my third one today. Something called “Reincarnation” (Japan), The plot was quite easy to discern. I found the entire film “flat”. There were elements from “The Shining” thrown in (happens in a hotel filled with murderous spirits for one thing). The lead was basically a non-character (shakes head*) and that goes for the entire cast (with the exception of Shun Oguri, too bad he has a very small part here). You know its bad when you laugh at the supposed-to-be-scary parts. But I wouldn’t say it’s “horrible”, just as I said before, “flat”. I was about to watch “Ichi the Killer” (another Takashi Miike outing) but when I found out that it’s heavily edited (due to scenes of graphic violence and gore), I decided not to. I don’t like “mutilated” films, much better to watch the whole thing as it is (I’ll see if I could find the uncut version at VEOH, but I doubt it). I also wanted to see if they have streaming Gundam Wing, as I’ve left my copy in San Pablo City. Turns out they do, or did (it was removed due to licensing though). After 10 years, it’s still my favourite. Although I’ve seen SEED and Destiny in their entirety as well (and I found both engaging). 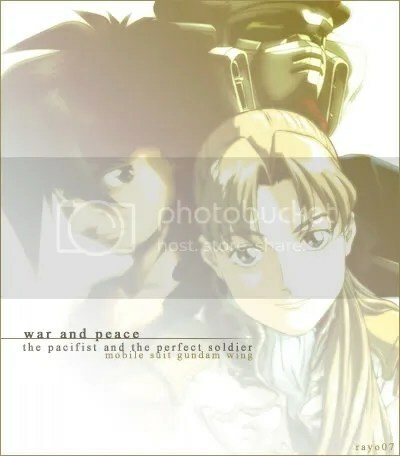 But Gundam Wing has Heero Yuy; SEED’s main protagonist doesn’t sit well with me, apart from the fact that I generally prefer “Byronic anti/heroes” – those seemingly-cold, sullen, brooding characters, as they seem more interesting. And (maybe it’s just me), but SEED does get confusing at times, not because of the story, but because there are SO many characters (partly because supposedly-dead ones keep on coming back, and then they add another “pile” of new ones on top of that)! There’s a scattered feel to the proceedings and “character harmony”, (its an elusive quality I always look for, a sense that the characters are somehow “connected”, it’s either it’s there or it’s not) I’m sorry to say was very minimal. After a sneak preview of Gundam 00 on September 1, 2007, Anime News Network remarked “striking parallels” between the series and an earlier installment of the metaseries, Mobile Suit Gundam Wing (1995): “Like Gundam Wing, Gundam 00’s main story begins with hyper-powerful Gundam units appearing at various locales to execute slightly-less-than-Dynasty-Warriors-level mayhem in synchronized phases of a paramilitary operation.” Later, Carl Kimlinger of Anime News Network suggested that just like Mobile Suit Gundam SEED adapted the original Mobile Suit Gundam (1979) for modern audiences, Gundam 00 is an attempt to do the same with Gundam Wing. He also remarked that “its political flavour […] is distinctly post-9/11“. Oh, and the main protagonist looks promising as well. Finally, Goodbye Kira Yamato; Hello Setsuna F. Seiei! A Gundam Meister and pilot of the Exia Gundam. He grew up in the war torn Middle East and was discovered as a pilot with huge potential by Celestial Being at the age of 14. He generally keeps his feelings inside and comes across as cool young man. Now who does that remind you of?? Last Movie Seen: “Sunshine” (It appears that the “critics” and I agree when it comes to this. It’s a good one. It may seem a rather odd film – one thing, Cilian Murphy playing against type as the “protagonist” – but the cast is solid (Hiroyuki Sanada, Michelle Yeoh, Benedict Wong, Rose Byrne, Cliff Curtis among others). Although , I’m a bit disappointed with the ending,when it suddenly took the “Event Horizon” route – complete with the ghastly villain.) But I liked it so much that I’m planning to do a “sketch” series of the characters – I don’t think I’m up to doing any “full” pieces at this time – in the spirit of HEROES. Well, I’m a bit happy today. My Internet Connection was configured last night. Another something to counter the tedium. It’s still the same thing at work. Day in day out. The world is…. Two job interviews, one tonight, one tomorrow. Let’s see what will happen. So far, I’ve been contenting myself with a sketch or two every now and then. sketch made by ayomr2007. “old picture” effect done on photoshop. The picture on the left-most corner (Diana circa 1993) was done about a few months ago, which was obviously not finished, hence the immense white space near Diana’s fully shaded face (I might finish it someday- who knows), the one at the center (circa 1981) was done last week (in a fit of boredom – I was perticularly intrigued by her expression here, if you would like to know who she was “leaning” on, it’s none other than her “failed” Prince Charming. 😀 The third picture (circa 1997) was done sometime during August or September (which I am still uncertain what to make of).